Scotland women's hockey head coach Gordon Shepherd has named four new caps in his squad to play three matches against Germany next month. Clydesdale Western trio Camilla Brown, Fiona Bruce and Rowan Sinclair, and Bath University's Fiona Burnet come into the 18-strong group. "We wanted to give them an opportunity on the international stage to stake a claim in the squad," said Shepherd. Leigh Fawcett captains the team for the series in Moers, north-west Germany. 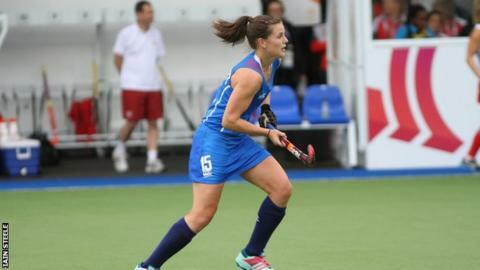 The three games against the team ranked seventh in the world rankings mark the beginning of Scotland's preparations for the EuroHockey Nations Championship in London next August. Grove Menzieshill defender Fawcett takes on the captaincy following the retirement of Linda Clement, while Aileen Davis, Amy Gibson, Emily Maguire and Morag McLellan are not available for selection with commitments to the Great Britain squad. Shepherd added: "It's going to be a tough camp as they won't just be about playing matches; there will be training, physical profiling and a lot more going on. "This camp is all about us learning and improving from playing a world-class side. "I know we will be able to compete with Germany physically, but it will be extremely hard for the squad, new and experienced players alike, as Germany are preparing for the Champions Trophy in a few months' time. "But they will give the new players a great opportunity to perform and help build our squad for the Europeans next summer. "It is a real bonus having international matches at this time of the year especially off the back of a big tournament as we wouldn't normally start preparations until warm-weather training in March." The Scots, 16th in the world rankings, will face Germany in Pool B of Europe's elite competition next summer, along with England and Italy. The two sides last met in Boom during the 2013 EuroHockey Nations Championship, with Scotland losing 1-0. With Scotland not participating in the current cycle of the International Hockey Federation's World League competition, Shepherd was keen to emphasise the importance of these matches, stating: "It's a shame we miss out on World League as after the Europeans we don't have another tournament till 2016. "International games are vital for players' development so it's important we get these games." Midfielder Nikki Kidd is in line to win her 150th international cap should she play in all three matches. Scotland senior women's squad to play Germany on 13, 15 and 16 October: Jennifer Eadie, Susan McGilveray, Alison Howie, Nicola Skrastin, Rowan Sinclair, Camilla Brown, Fiona Bruce (all Clydesdale Western), Vikki Bunce, Becky Ward, Heather Elder (all Dundee Wanderers), Nicola Cochrane, Becky Merchant (both Edinburgh University), Sarah Robertson (KHC Leuven), Kareena Marshall (Western Wildcats), Leigh Fawcett (captain, Grove Menzieshill), Robyn Collins (Beeston), Nikki Kidd (Mannheimer HC), Fiona Burnet (Bath University).